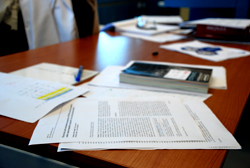 Writing a dissertation or thesis is a time-consuming but rewarding experience. To guide you through manuscript preparation and to help you create a uniform and visually clear document, the Office of Research & Graduate Studies has developed the Thesis & Dissertation Manual. It is a guide to Alfaisal University's specific style requirements, providing examples of what is required to receive approval from the Office of Research & Graduate Studies. Do not wait to review the Thesis & Dissertation Manual until the semester you anticipate graduating or when you have already scheduled a defense date. Visit the Thesis & Dissertation Manual early and often during the writing process. It is highly recommended that you print a copy of the Thesis & Dissertation Manual. If questions arise while you are working on your thesis or dissertation that are not answered in the Thesis & Dissertation Manual, please contact the Office of Research & Graduate Studies. It sets forth definitions, policies, and procedures for approval, processing, budgeting, and accounting for research funded from internal and external sources as well as ethical practices. Alfaisal University requires that you make your research accessible to the academic community at large. This is effected by publishing your dissertation/thesis through ProQuest and making it available through both ProQuest and Alfaisal University Library. Further, your dissertation/thesis may be accessed via various internet search engines, such as Google. Again, making your research accessible to the academic community at large is a condition of Alfaisal University's awarding research doctorates and master's degrees to those completing a degree that requires a dissertation/thesis as a culminating experience. Therefore, permanent and temporary embargoes and abstract-only publication are disallowed. An essential reference tool when writing a dissertation or thesis is a department-approved professional style manual. You must consult a style manual recognized by a professional society in your field. To determine which professional style manual is appropriate for your discipline, consult with your advisor. Common manuals include those published by the American Psychological Association (APA), the Modern Language Association (MLA), and the University of Chicago Press.